Station alerting is one small, yet important component of a dispatch system. Like many departments, in Pinellas County, Fla., until recently all on-duty firefighters were alerted to an incoming dispatch collectively, whether the individual crew or truck was actually required to respond. Pinellas County fire chiefs expressed concern over this system. Alert tones were already unique to the station being dispatched, but they wondered if it would be a much better solution to modify these alerts, allowing individual crews to immediately recognize whether the call was for them. Further, they wondered whether these alerts could be limited to only sound in the bunk rooms of the crew that needed to be notified. As referenced in the IAFF publication “A Guide to the Recognition and Prevention of Occupational Heart Disease for the Fire and Emergency Medical Services,” studies have shown that while small, there is a measureable increase in heart disease risk due to noise exposure. The manual notes, “The characteristics of the noise that have been associated with heart disease include unpredictability, a lack of meaningfulness, high volume, and of an intermittent nature”—all factors that come into play for firefighter alerting systems. The authors conclude that “To reduce unnecessary noise exposure, station tones should alert only those personnel in the station and/or bunk rooms that need to respond to the current call for service.” Other experts have suggested using alert tones that employ an escalating volume to further reduce stress to cardiovascular systems caused by noise exposure. All of this information provided Pinellas County Public Safety Services (PCPSS) with the motivation it needed to upgrade its current system to meet the above recommendations. Pinellas County (pop. 916,542) is located on a peninsula on the west coast of Florida. PCPSS operates a primary PSAP and consolidated dispatch center dispatching for 19 fire departments. Countywide, there are 63 fire stations, each with its own complement of first responder apparatus and personnel. Some fire departments in Pinellas County are located in densely populated urban areas, some serve small beach communities and others have responsibility for fire protection of large wooded areas. As part of the county-wide initiative to upgrade to a P25 digital system, PCPSS chose Motorola’s FSA4000 solution to be used as the station alerting equipment at each of the fire stations. This solution provides the desired levels of redundancy not only in base equipment but also in transmission abilities. 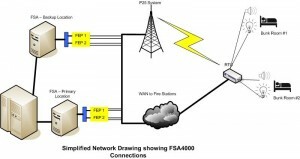 PCPSS achieved redundancy by installing two FSA 4000 base stations at separate dispatch locations. 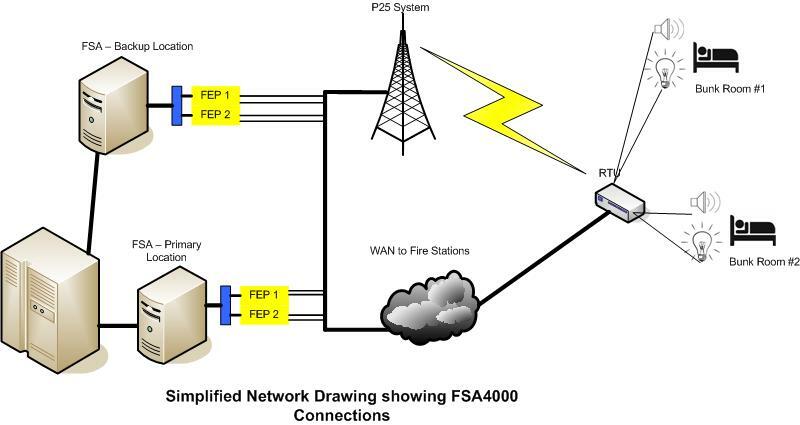 Additionally, the FSA 4000 provides concurrent connectivity over the existing fire station WAN and RF links. The FSA4000 system allows for programmable tones to be recorded and uploaded into each Remote Terminal Unit (RTU). Perhaps most importantly, the audio zoning feature allows speakers and/or lights to be automatically activated in selected bunkrooms based on the type of alert or zone selected. The initial proposal allowed for only five individual zones. PCPSS met with local fire departments to decide if alerts would be based on call type or on the unit assigned to the call. With the fifth zone reserved for use when multiple units are to be alerted at any one station or as a station-wide alert tone, only four zones were available from which to choose. With such diversity in fire department alerting needs across the county, it was extremely difficult to get consensus from the fire departments on which alerting method to use. Through further conversations with the vendor, we found that there was another creative option that would allow 15 tones at each station. Once this discovery was made, we realized that a combination of both call type and unit alert methods could be implemented. PCPSS computer aided dispatch (CAD) software is unique; many years ago, we purchased the rights to modify the software source code and chose to make an investment in skilled personnel who had the ability to customize the CAD software for the needs of all PCPSS stakeholders. Therefore, PCPSS programmer/analysts developed both the data structure solution and the software program interface to the new fire station alerting system. Each zone is activated by a unique four-digit code, which is then tied via data to either the unit type or the call type. The code for the individual apparatus is entered into the individual unit numbers, so a single unit being dispatched from a station will hear their individual engine, truck, etc., tone. 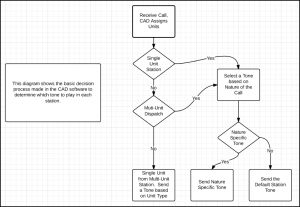 When two or more units are dispatched from the same station, the interface software will choose the call type code alert tone so that they will be alerted to what type of call they are responding to. 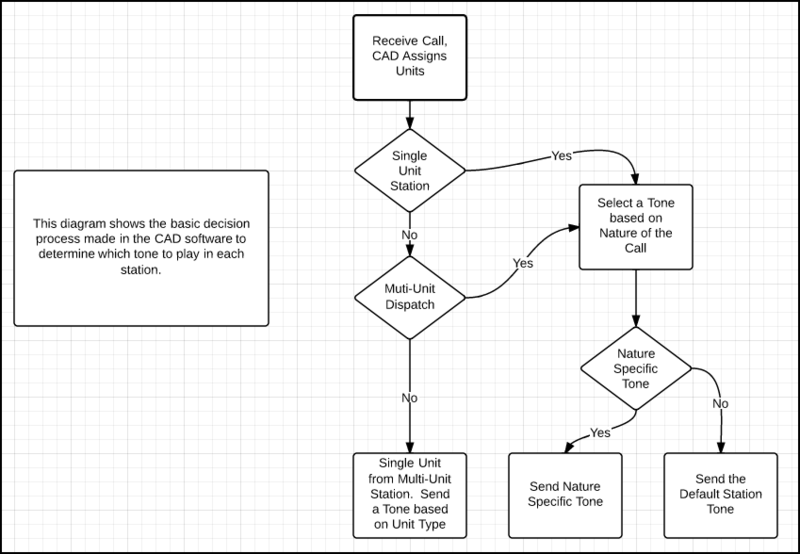 If two or more units are dispatched from the same station and the call type is not designated as one of the most common call types, the default/station tone is used and the emergency responders listen to the verbal announcement provided by a dispatcher. Some of the stations in Pinellas County run as a single-unit station. Using the above concept, if a lone apparatus is dispatched from a station, the only alert tone they would ever hear would be the engine, truck, district chief, squad or rescue tone. Although that would work, it does not utilize this new system to its fullest capacity. Therefore, PCPSS programmers made one final modification so that those units responding from a single-unit station would always receive an alert tone that matched the call type. PCPSS created tones for each of the five common unit types using individual tones with a voice imported at the halfway point in the escalation; the voice states the unit type (engine, truck, etc.). The call type tones use the same escalating tone volume, but the voice that comes in at the halfway point indicates the call type (water rescue, structure fire, medical, etc.). The tone creation involved quite a lot of manipulation. This was not simply taking a .wav file and uploading it into the station RTU. The .wav files were created and then the tone was basically recorded as it was played over a cabled connection to the RTU. This did require several manipulations of the original .wav file to get the amplification levels correct so the tones sounded true when played by the RTU over the fire station speakers. The current tones are available at www.pinellascounty.org/911/AlertSamples.htm. PCPSS has completed the upgrade to this new alerting system at 13 stations, with the feedback being extremely positive. Providing the fire departments within Pinellas County with this custom solution allows for the individuality of each station and, as bunk rooms are wired properly and personnel placement is considered, late-night alerts can be limited to only those personnel who need to be alerted—thereby improving the health and welfare of station crews and providing quicker incident type recognition. Gail Tyburski learned software programming while employed at Pinellas Ambulance Service in 1982. She later continued on as an employee of EAI, a local software company that went national from 1988 to 1993. Since 1993, Tyburski has been employed by Pinellas County to customize and continue innovative software development to the 911 dispatch and fire department.